The Geneva Automobile Show tends to often be the most interesting of the major annual auto shows, and this year’s, held last week, was no exception. While there were all sorts of exotic and “green technology” (sometimes both combined) production models and concepts on display at Geneva, many of them integrating Apple iPads and iPhones in various ways, my favorite was, of all things, a minivan. Not just any minivan, mind you, but a reincarnation of sorts of the great granddaddy of all minivans – the original Volkswagen Type 2 Transporter (sometimes confusingly referred to as T1 for “Transporter 1”). It would be understatement to call the Type 2 VW iconic. 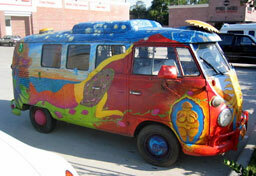 It became an emblematic symbol of 1960s and 1970s counterculture, ever-identified with the hippie era both as a counterculture statement – being the antithesis of American cars of the day – but also for practical reasons, notably its capacity to carry large numbers of people and their stuff. Folk singer Arlo Guthrie drove one that figured prominently in his 1969 film Alice’s Restaurant Massacree and the eponymous 1967 18-1/2 minute song, “Alice’s Restaurant Massacree”, the movie derived from. 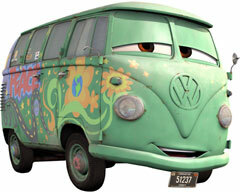 More recently, In the 2006 Pixar movie Cars, the hippie van Fillmore is a VW Type 2. However, VW vans were also popular with tradespeople and families for their commodious seating and carrying capacity in a relatively compact vehicle that actually shared the same power train and chassis design as the Volkswagen Beetle. Having spent substantial portions of my youth tooling around in Volkswagen vans, as well as having admired the intelligent, tongue-in-cheek award-winning Doyle Dane Bernbach Volkswagen ads of the era, this all plucks resonant nostalgia chords with me. VW Microbus at 2007 Metro Cruise in Grand Rapids, MI. Germans called the rear-engine Type 2 the Bulli, Kombi (Kombinationskraftwagen – “combined-use vehicle”) – or the Samba bus or Deluxe Microbus when equipped to the highest trim level available – with 21 or 23 windows including the split front windscreen and a large sunroof. 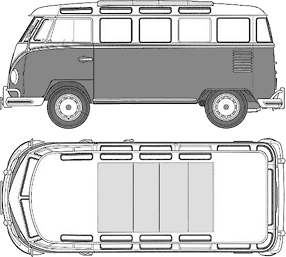 The standard Microbus had 11-windows. Deluxe models had 15-windows. The sunroof deluxe versions had eight skylight windows and is known as the 23-window. A 13-window and 21-window version were produced starting in 1963. To Americans and Canadians, the Type 2 was the Microbus or just the VW van, and in Latin America it was the Combi, but whatever the nomenclature, the world’s first minivan still has a fan base spanning the globe. 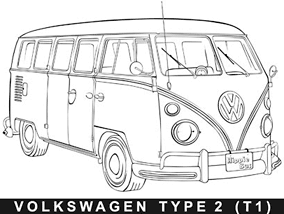 The Type 2 was built in three generational families – the classic split-windshield T1 of 1950 to 19’67; the T2, nicknamed “Breadloaf”, from 1968 to 1979 (still in production in Brazil); and the T3 or “Vanagon” from 1979 to 1992 (in South Africa until 2002). The original VW vans had their shortcomings. The flat front offered minimal protection for driver and front-seat passenger from injury or worse in head-on collisions. It was almost unbelievably gutless, originally equipped with 1131cc, 25 HP, air-cooled four-cylinder engine; engine capacity was increased to 1192cc and 30 HP in 1954, bumped again to 34 HP in 1959, and an optional 1497cc, 42 HP engine became available at extra cost, with another boost to 44 HP in 1965. The rear engine VW vans handled dangerously (by reasonable standards) in strong crosswinds, due to its rear weight bias and swing axle rear suspension. VW vans were actually banned from some bridges in the US during windy conditions. They also had a dismaying tendency to catch fire. Two operated by people I knew did, and blackened paint around VW vans’ engine compartment lids wasn’t an uncommon phenomenon. Despite its top speed of about 85-90 kilometers per hour and accelerating at the rate of continental drift, the low-geared VW van also delivered mediocre fuel mileage, and it was as cold as charity in the winter. One of my friends used to drive with a catalytic naphtha gas camp heater on the floor of his, and I recall a road trip in an ice storm holding my hand over the passenger-side defroster vent so the anemic zephyr of lukewarm air from the pathetic heater could clear a few centimeters of icing from the windshield bottom while the driver peered out hunched down over the flat, bus-type steering wheel to see where we were going, sort of. By contrast, the Chrysler-engineered Volkswagen Routan is a much better vehicle, boasting a five-star front and side impact safety rating, is competitively priced, but it doesn’t have the soul of the old Microbus. For Apple aficionados, the VW Microbus has a special significance, since Steve Jobs (who still fancies German automotive hardware) owned one back in 1976. He sold it, along with his HP scientific calculator, to help raise the $1,300 he and Steve Wozniak needed to launch Apple Computer. So, in a way, the VW Microbus was instrumental in the genesis of the multinational company that eventually produced iPad, along with the Mac, iPhone, iPod, and was to become one of the world’s richest corporate entities. This year at Geneva, Volkswagen unveiled a really authentic and serious reinterpretation of the legendary Type 2, launching it into the future in the form of a concept vehicle for a new generation Bulli or Microbus, which appropriately given the history, is highly integrated with Apple’s iPad. With this vehicle, Volkswagen says it’s finishing what it started in 2001, noting that ten years ago the vision of a new Bulli led to an unforgettable concept vehicle known as the Microbus. However, they note that some visions need to mature before they yield something new, and the time is now right for this vision to be realized because the necessary, sustainable technologies are now at hand. Designed to be more compact and affordable than the earlier Microbus concept vehicle, the new Bulli van concept shown at the Geneva Auto Show is powered by an electric motor and fitted with six seats, and with infotainment control via, you guessed it, Apple’s iPad. A removable iPad in the center console serves as a multifunctional touchscreen. Along with Internet-based iPad applications and the media center, it also handles control of such functions as Bluetooth handsfree telephone and a navigation system. Integrated right on the van’s iPad mount are controls for the climate control system and the centrally-located hazard warning switch. The Bulli also has a sound system produced by legendary guitar and amplifier manufacturer Fender (USA). At Woodstock in 1969, Jimi Hendrix played The Star Spangled Banner on a Fender Stratocaster guitar. VW says this latest van concept has the potential to establish a new, fifth brand of people carrier next to its Caddy, Touran, Sharanm and its large counterpart the Caravelle – none of which are sold in the US or Canada. “But wait a minute,” I expect some readers are saying, “What about the Routan minivan that Volkswagen rolled out at the 2008 Chicago Auto Show and has offered for sale in North America since September 2008. That was more than a bit over-the-top, especially the “German engineering” brag for Routan, for which VW did specify some changes from Chrysler specs, such as “European-tuned suspension” and different interior materials, trim, and colours. Actually, given Chrysler’s at the time recently-severed decade-long tenure as part of DaimlerChrysler, and with Daimler-Benz still retaining 20% interest in the New Chrysler Corporation (since divested), there probably actually were some German engineers at Chrysler’s development center in Auburn Hills, Michigan, but under its Euro-tweaked skin the Routan is as American as baseball and apple pie, with its 3.6 liter, 283 hp. Chrysler V6 engine and six-speed manumatic transmission and interior phone, navigation, audio and entertainment systems. Chrysler has all but perfected the minivan concept since introducing its game-changer Magic Wagon a quarter-century ago, and nostalgia aside, in truth the old VW microbus really wasn’t a very good automobile. 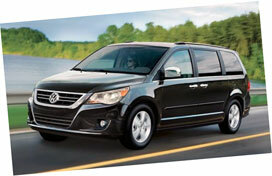 The Routan is certain to be better in every way than the old VW microbus. The Chrysler minivan is an excellent vehicle, but I don’t think many 1960s veterans bought it as a reincarnation the old Type 2 Microbus. 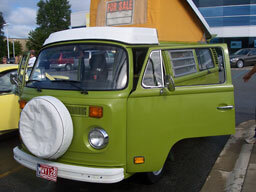 Hopefully, if the Bulli goes into production, VW will choose to ship it to North America. The company notes that, thanks to highly advanced drive technologies, the Bulli being shown in Geneva is a “zero emissions vehicle”, because the concept is electrically powered. The Bulli’s electric motor outputs 85 kW of power and an impressive 199 lb.-ft of torque. As is characteristic of electric drive, its maximum forces are generated from standstill. The silent motor is supplied with energy from a lithium-ion battery with a maximum storage capacity of 40 kWh. This electrifying combination enables driving ranges of up to 186.4 miles, excellent in the full EV context and far exceeding the currently available Nissan Leaf EV’s circa 100 mile range between recharges. When the Bulli’s battery is charged at an electric refueling station specially designed for electric vehicles, the charging process takes less than one hour. The new Bulli accelerates from 0 to 62 mph (100 kph) in 11.5 seconds, and its top speed is 87 mph (electronically limited), ho-hum performance by today’s automotive standards but far exceeding the capabilities of the original VW Bulli/Microbus and enough range and driving performance to make this EV not only ideal for short distances, but also for most commuters and recreational activities – and with zero tailpipe emissions (for that matter no tailpipe at all). However, the new Bulli evidently won’t be available only in EV form, and Volkswagen says the concept can also be powered by the company’s gas and diesel direct injection engines as alternative drives, noting that with today’s technologies, engines with 1.0 or 1.4 liter displacement (not far off the T1 Type 2’s 1.1 to 1.5 liter displacements, but now both fuel efficient and satisfactorily powerful), ideal for anyone who wants to cover maximum distances with minimal fuel consumption. The VW minivan concept was originally conceived by Dutch Volkswagen importer Ben Pon, who on April 23, 1947 sketched a picture of a compact bus in his notebook – a simple side view of a flat-fronted bus form factor placed over the wheelbase of a VW Beetle. Volkswagen designers took Pon’s sketch and created the bus that became an automotive icon with the characteristic VW logo on its bluff front. The Bulli concept follows in the footsteps of the original Microbus featuring maximum space utilisation and bringing back the characteristic VW logo at the front end in white, and clean, uncluttered styling with two-tone paint themes. The concept’s the entire sheet metal area above what is known as the character line is white. The continuous line of side windows creates an especially striking contrast between the white sections. Beneath the character line is the contrasting color body area. Design elements such as the distinctive wheel housings, the additional shape modulation in the door surfaces above the side sills, and the headlights that wrap around to the sides with minimal seams are details that would not have been possible to manufacture in this form and precision on a Type 2. Concealed in the sandwiched floor behind the sills is the electric Bulli’s 1,450 kg lithium-ion battery. The white door handles are practical, opening in the direction of pull. The attractive 18″ alloy wheels have stylized chrome hubcaps as another tribute to the Microbus of years past. Shorter than ever are the overhangs at the front and rear. The new edition of the Bulli is 156″ long, 68.4″ wide, and 66″ tall. The Type 2 was somewhat longer and taller, but narrower. With a wheelbase of 102″, the Bulli utilizes the overall length very well. Also striking here are the Bullis relatively large track widths (54″ front and rear) in relation to body width. In keeping with Volkswagen design DNA, there is a horizontal layout of the narrow dual headlights with L-shaped LED daytime running lights and turn indicators implemented as LEDs arranged in an inverted L shape at each outer corner. Incidentally, LEDs not only exhibit tremendous luminous power and long life; due to their low energy consumption, they are ideal for the electrically powered Bulli of 2011. Located between the headlights in the bonnet is, as always, the VW logo. On the level beneath, one finds once again arranged in a horizontal line the air intakes for the passenger compartment and for battery cooling or for cooling the alternative conventional drives. Finally, the bumper that is seamlessly integrated in the front end completes the design. Laterally, it exhibits a large round fog light on each side, another air intake in the middle, and a front spoiler in black below. This line matches the lines of the side sills. 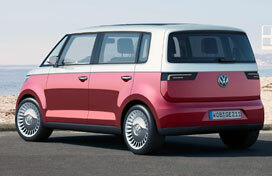 The Volkswagen design DNA with its horizontal lines also dominates the rear of the new Bulli. Viewed from the bottom upwards, above the body-colored bumper (including black, stylized diffuser), there is the tailgate that extends across the entire width of the vehicle. In the tailgate, the narrow LED rear lights continue a theme from the Microbus concept of 2001. At the center, but smaller than at the front end, the VW symbol. When all six seating locations are fully occupied, there is a 370-liter luggage space behind the tailgate. Like the body design, the interior is also marked by a level of clarity whose consistent application can only be found at Volkswagen. Like the Type 2 in times past, thanks to its level floor, the new Bulli is also equipped with a single bench seat in front and space for three in the rear as well. The outer and middle seat positions of the front bench seat can be folded down (2/3 split); the rear beach seat, meanwhile, can be completely stowed. When the rear bench seat is stowed, cargo capacity increases to 1,600 liters. In addition – and here the new Bulli is reminiscent of its legendary ancestor – the seat system can be transformed into a large reclining surface with just a few manual movements. This turns the compact Bulli into a compact camper the ultimate companion for a weekend trip. At least as important for many users, however, will be that the seating system also offers creature comfort. The seat position is comfortably high and offers an optimized view forward as well. Contributing to peace of mind aboard today’s vehicle is the fact that the new era Bulli is equipped with all conceivable safety features. That is the crucial difference: The automobile has essentially been reinvented since the days of the first VW Type 2. All cockpit details are clearly organized and designed to be intuitive. Running laterally across the entire width is a line with air vents. In front of the driver, there is a speedometer in the shape of a semicircle. A color multifunction display, also semicircular in shape, can be used to view and control (via multifunctional keys in the steering wheel and on it) the navigation system, telephone, trip computer, and media center, and the entire unit of speedometer and multifunction display also communicates with the integrated iPad. 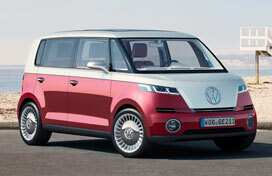 It will be interesting to see how the modern VW Bulli fares in the 21st Century marketplace, if it enters production. Perhaps VW and Apple could collaborate on a special Apple edition, building on the van’s iPad integration, and sell it as the iVan.